President John Aufdermauer brought down the gavel at Don Jose’s in Castro Valley, and asked Steve Ontiveros to lead us in the Pledge of Allegiance. SINGING WITH CETA & JIM NEGRI & CONGRESSMAN ERIC SWALWELL - God Bless America! VISITORS - Cliff Sherwood introduced Angela Dunbar (sheeeeeeeeeeeee’s baaaaack! ); Ellyse Look, President of RotorAct East Bay; Mary Oliver-Iglesias, Melanie “We are seeing a lot more of Jerome now that she is attending the meetings” Blaha; Ira Hillier (San Ramon Rotary); Ellen O'Donnell; and Virginia’s Chauffeur and Personal Assistant (and Husband), Duane. HELLO SONG - Ben Gurule celebrated everyone being present, especially our guests! 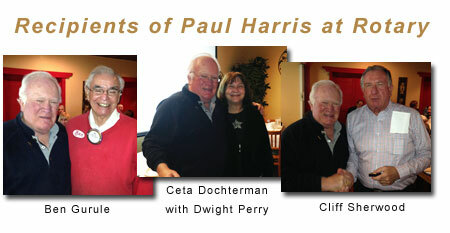 PAUL HARRIS AWARD - Dwight Perry presented three of our members with Paul Harris Awards today: Ceta Dochterman (plus 8), Cliff Sherwood (plus 5), and Ben Gurule (plus 4). Thanks to all three for being such a blessing to so many around the world. TEXAS HOLD’EM POKER TOURNAMENT - March 22 - Masonic Lodge - THIS IS OUR LARGEST FUNDRAISER AND FUNDS MANY OF OUR PROJECTS - 5 PM Dinner and 6 PM Tournament - WE NEED PRIZES AND PLAYERS . . . $200 buy-in . . . sign-ups are on-going . . . Alan will be having poker lessons at his house by the world famous poker players: Alan West and Dwight Perry! Watch your email for the date! More info to follow! PAYING IT FORWARD - None today. PROGRAM - Today United States Congressman (15th District) Eric Swalwell visited us, accompanied by one of his aides, Jason McCartney. Congressman Swalwell shared that he was the oldest of four boys and his goal was to attend college on a soccer scholarship. He wanted to improve so much that he took part-time jobs and a youngster to help pay the expenses of his playing on traveling teams. He “started’ in politics working for Ellen Tauscher . . . and the rest is history . . . Congressman Swalwell, a regular participant in the Rowell Ranch Rodeo Parade, listed his Legislative Highlights as: voted a comprehensive two-year budget agreement, voted for a stronger Violence Against Women Act, Passed an Amendment to allow military bands to play again at events like the Pleasanton Scottish Games (and it was signed into law! ), prevented TSA policy to allow knives on-board planes and secored $12.8 million for BART transbay to be upgraded to protect the system from terroism. On the Congressional Agenda is Comprehensive Immigration Reform, Raising the Milimum Wage and Emergency Unemployment Insurance, Trade Legislation and Appropriations. His Legislative Agenda includes: Serving as top Democrat of the Energy Subcommittee, Protect our federal investment in clean, American-made renewable energies; Comprehensive Immigration Reform providing earned citizenship for undocumented immigrants, Increase H-1Bs for high-skilled workers while investing in STEM educaiton to prepare our children for a 21st economy, and Strengthen border security. Congressman Swalwell is committed to being bipartisan wherever possible. He learned that at his dinner table where he grew up the only Democrat in a Republican household! 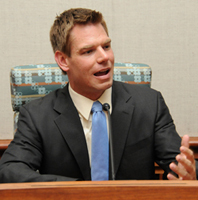 For more information on our Congressman, visit http://swalwell.house.gov/ or come by the Rowell Ranch Rotary Parade on Saturday, May 10, where he will be an active participant . . .he would not have it any other way! LOOKING FOR THE WHITE MARBLE - With $44 and 17 marbles, Ray Wallace (again!) reached into the sack and won . . . $5!